The jOrgan program that Les wrote controls the equivalent of 17 ranks of Wurlitzer organ pipes. 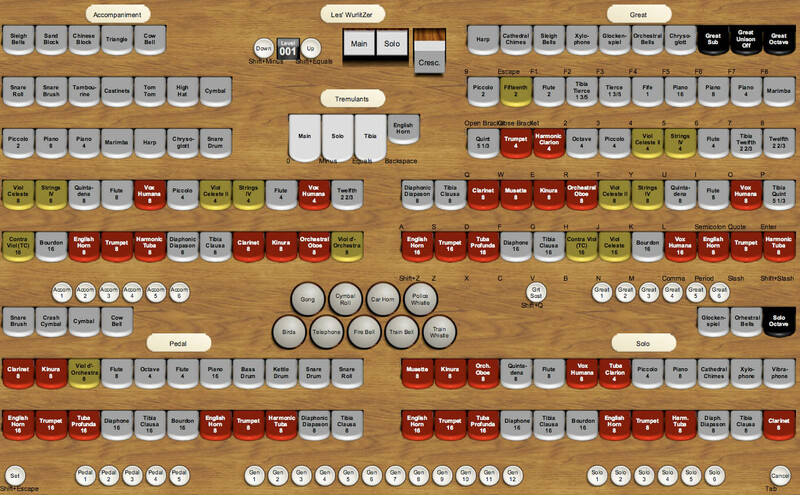 The console layout is similar to what would be available on a Wurlitzer theater organ. In addition to the stop controls, the console contains two swell (volume) pedals, an array of combination pistons (that match exactly what is available on the Rodgers 945 organ), and a "toy counter." The Toy Counter, which allows funny sound effects at the press of buttons, was not used on the recording of "South." jOrgan is written in Java and will run on the Apple, Windows machines, and Linux.